I’m tired. And it’s only 8.00 a.m. I trudge along the dirt track that leads me to the latest village I have been frequenting. After two bus rides that pulverised my morning meal quite successfully, and a quick zip on a motorcycle, during which I nearly flew, I must complete the last two kilometres on foot. This is hardly surprising, considering the village I am going to is infamous for the absence of a proper road, school, primary healthcare centre, and crèche. Even the most ardent of visitors, that persevering species called the political campaigner, does not come here. The long Indian summer has begun. Photograph by Chandni Singh. The famed Indian summer has begun and I swelter under the unforgiving sun. My throat is parched and most of the fields lie empty, thirsty, and cracked. The dust-laden track is lined with stunted trees: babool and dhaak, so scrawny by overgrazing, you’d hardly believe they could grow to be majestic trees. A dog, panting heavily and covered in slime, trots past—I know he has been sitting in whatever water is left in the puddle at the bottom of the village pond. Just weeks back, I had watched the wheat graze the wind, a verdant carpet swaying gently, holding the promise of a full granary and if luck would allow it, perhaps some extra cash. Now the stalks are bent with their bounty, the fields are golden, the rich colour of money. And summer. 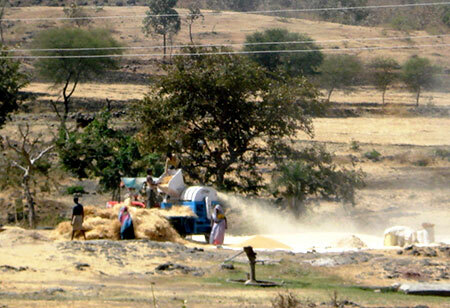 Ahead, a thresher is at work, noisily separating grain from chaff. Khatu Lal Meena’s family is hard at work. I make my way to where they are, careful to avoid the clumps of wheat stalks in the fields, they are like daggers, dry and sharp, left for the cattle to graze on. The family of seven is working fast—the thresher is expensive at Rs. 500/hour, not to mention the two bags of grain they will have to give as additional payment. Threshing has already been delayed a week and market prices are spiralling downward again. Finally, I reach them and then shout over the roar of the thresher, “Ram Ram Khatu Lal ji!” He acknowledges my presence with a lusty Ram Ram and carries on, every minute is precious. I watch them as they work in quiet unison. The thresher is expensive at Rs. 500/hour, not to mention the two bags of grain they will have to give as additional payment. Photograph by Chandni Singh. The girls pass the bundles up, their faces are covered with their dupattas for the chaff makes breathing difficult. They move fast, for they must keep up with the men ahead and though they make it look easy, I see their palms have gashes where the wheat stalks have pierced into their skin. The men of the family stand on top of the thresher—feeding its ever-hungry mouth with more bundles of wheat. Khatu ji, the aging patriarch, is bent double, his knees are so bow shaped that they would appear comical if not so pathetic. 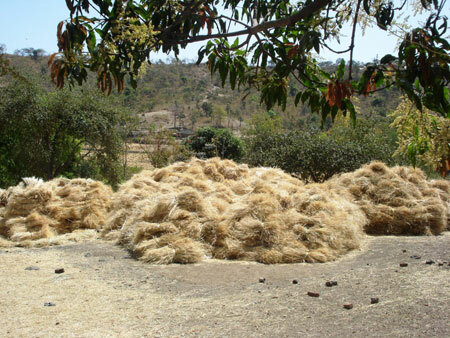 He grimaces with each bale of wheat he feeds into the thresher, and the chaff makes him wheeze. His son, Vimal, moves skilfully. He’s learnt well from his father but he must be careful. Only last year, someone in the village had lost a hand while stuffing wheat into a thresher. Vimal knew well that being a handicap in a farming family was a deadly curse—the ignominy of being an extra mouth to feed without the solace of being a helping hand. Below, collecting the golden grain sits Leela Bai, Vimal’s mother. She’s wearing a pair of very thick glasses, the kind they used to wear after getting a cataract operation. Modern-day laser surgery eliminates the need for such glasses but one doesn’t get modern facilities in the free sarkari eye camps. Sitting on her haunches, she deftly collects the wheat as it pours out of the thresher. The glasses magnify her eyes enormously and when she talks to me, it seems as if she is very interested in what I have to say, which of course, I chide myself, cannot be very true. Suddenly, the noise dies down. The family is taking a break and I sit down with them. They are keen to talk to me, for they have heard I have been inquiring about the water situation in the village. Leela Bai offers me some water from her copper pot—it is still cool and I gulp down some. It is a muddy brown and tastes queer. She looks at me apologetically: “Beta, humare paas yahi paani hai.” (Child, this is the only water we have.) Grateful for the water, for I know this supply must last them till dusk, I thank her, starting out with my questions. My eyes look at their sunburnt faces and find myself hoping that the wheat will feed all these mouths for a year. The long summer has just begun. This is part of a series called ‘Village Vignettes‘. As part of her Ph.D. in International Livelihoods at the University of Reading, U.K., Chandni Singh is trying to piece together the story of water availability in rural Rajasthan and what farmers are doing to adapt to their changing environment. The series is an ongoing compilation of her experiences as she traverses the district of Pratapgarh, in south Rajasthan, armed with her notebooks, kolhapuris, and water. Of course. You have got a flair with words. They read so easy! Brilliant! One gets into the habit of saying this, even if a bit reluctantly. Thank you :) It means a lot, coming from you. I have always maintained so.